Media Future Week 2017 has a 50 hour program for participants. But keynotes and presentation sessions are free for all! Fill in this registration form to gain access to the limited available seats. Entrance is free. All lectures take place in Beeld en Geluid at the Mediapark in Hilversum. See: www.mediafutureweek.nl/speakers/ for bio’s. During Media Future Week, participants work on real cases from organizations. These casepartners are therefore an important part of MFW. Previous casepartners were very impressed with the creative and hard-working students. “There are brilliant ideas in the presentations that we can use almost immediately” and “The concept appeals to us very much. We invited the team to develop this vision further with us”. Do you have an issue / case that requires thinking of enthusiastic young professionals? Are you wondering how digital natives perceive your problem? Would you like to develop your product / service to a future-proof concept by the top 1% of Dutch media students? 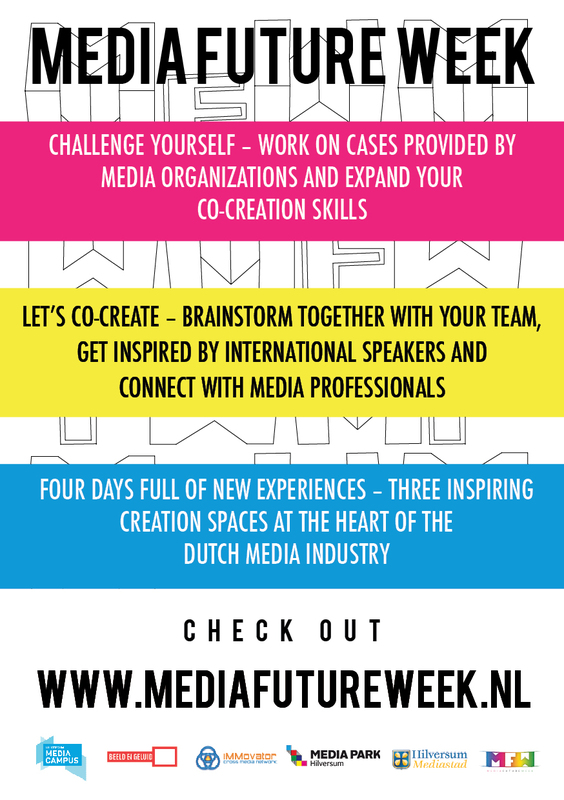 Participate in Media Future Week as a casepartner! MFW is still looking for open minded case partners and companies that want to feed the event and the teams with their inspiring case, matching the theme ‘Design for storytelling in a post-truth media world ‘. The intensive week asks for relevant casepartners that dare to challenge the participants to experiment, who have the ambition to shape the media future to make a difference, and thereby to collaborate with members of Media Future Week to grow and learn together. Get surprised by the visions of the future of upcoming talent! Would you like to know more about Media Future Week and the possiblity to become a Casepartner? Mail us via info@mediafutureweek.nl for more information.